Art and Amy were very helpful and friendly. Our needs and wishes were nicely met. White River Cabins is an excellent place to stay! It has a quiet and relaxing atmosphere. You're never quite sure what a place will be like when you pull up without having seen it first. We were definitely not disappointed! Hospitality has always been gracious. We had a carefree weekend in this Beautiful place. The rates are so reasonable .. Owners are so nice and helpful ... I have already referred many of my friends. Stay here you will not be disappointed. The view is wonderful. Such a comfortable and peaceful place. Serene with a Beautiful view...Yet the WIfi is lightning fast.., I will always stay here for the Value .. Comfort and the view. Owners are great . Everything about our stay in the White River cabins was beyond our expectations. We were 5 people, all over 50 years old, and we all felt like we stayed in a very down-home, and cozy atmosphere. Excellent cabins and wonderful owners. I would recommend these cabins to anyone who would ask about them. The staff is excellent and so nice and genuine! We had such a great time and the view was amazing!! We stayed 5 nights. We love everything you have done since our last stay. Staff was prompt with any requests. We just love it there. I needed help loading and unloading my motorcycle from my truck and the staff was more than happy to help.Thank You very much. Our cabin was very clean and well kept.The bed was very comfortable. What a view!!! Art and Amy were a pleasure to work with. We were traveling by motorcycle and they too, being motorcyclists, were kind enough to leave a room key out for us knowing we'd be arriving before they returned to open the office. They were also very eager to handle the legacy issues with the previous owners. They gave us excellent recommendations for dining in Eureka Springs. We are planning a return trip to the Ozarks and we will only be staying here. Property was awesome overlooking the White River. They were in the middle of upgrading all the cabins and the one we stayed in was very nice. It was truly like a home away from home. # 16 - Do not go to the same area for vacation. Want to see different things and areas. Road from the highway was hard to see at night. Had a fun time. Enjoyed the area. The view is absolutely incredible, Amy & Art have great customer service skills and are jewels! Art and Amy were amazing. They are so kind and went out of their way to make our stay just perfect. We were looking for somewhere to simply relax and relax we did. (I think melted is more the word and just what we needed). We stayed in Cedar ridge (upper cabin). The views are breathtakingly beautiful. We spent much of our time on the spacious deck overlooking the river. It was simply tranquil. The cabin is quaint, comfy and well stocked with all the necessary cooking needs. So if your looking for peace and quiet in a paradise like setting. This is the perfect place. We will definitely be returning again and again. I'd like to keep this place a secret, because it's such a rare find. The view, the comfort of the cabin we stayed in, the amenities, all 4-star! As we arrived and were greeted by Innkeeper Amy, she advised us they were in the process of installing new grills. We happened to have a couple of T-bones and baking potatoes ready for our dinner, so when she offered Art's personal grill we couldn't refuse. What a guy! They rolled it to our cabin, he gave a crash course in its operation and we enjoyed our meal compliments of the chef, but I have to give Art the credit he's due. Thank you again Art! We highly recommend the White River Cabins, located on the Arkansas White River and we hope to visit again. Just a hop, skip & a jump to Eureka Springs, restaurants and shops everywhere, not to mention plenty of beautiful natural scenery. It is "The Natural State" after all. Thank you again Amy & Art!! Beautiful sunsets, outstanding atmosphere, quiet, serene, this place is full of natural beauty. They are doing everything right to restore these cabins to their original state, only better. We really appreciate all the work Art & Amy are putting into their lodgings, and admire them for their skill and abilities, making us feel welcome and as alone as we wanted to be. New owners were great!! Will be back next year for sure. Great job!! Recommend to anyone staying in Eureka Springs. We booked a cabin for the kids and my best friend for our wedding weekend and it was perfect! We will be back. View is spectacular! Spent many hours enjoying it out on the deck. Cabin was nicely appointed and well maintained. Bed was very comfortable. Hope to stay with you again some day. It was great working with the owners!! Very nice people!! This property is so beautiful!! I will be staying here again for our next stay in Eureka!! My girlfriends and I always plan a Eureka weekend getaway (girls only) it's our 3rd year for our trip and our first time staying at the cabins!! We will be coming here from now on for our annual girls weekend trip!! Thank you so much for a wonderful stay!! Wonderful setting, dramatic views. I stayed in what would be the perfect place for a couple to enjoy a quiet respite amongst the grandeur of the White River. Peaceful, idyllic and a place that was difficult to leave. Everything but food and drink were provided. I was even able to grill a few dinners during my stay. Thanks so much and I look forward to my next opportunity to stay at the White River Cabins. We have been staying here for many years with the prior owners. The new owners are upgrading all the cabins with new paint and furniture, making the stay even more pleasant. We love the quiet area and the beautiful view from the cabin deck. 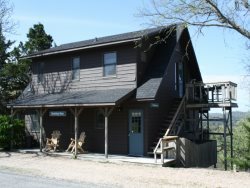 If you love cabin comfort, peaceful surroundings and friendly hosts, this is the place to stay when you visit Eureka Springs!